Featured Blog #21: FBW's featured blog is owned by a prize-winning blogger, online journalist, and educator. 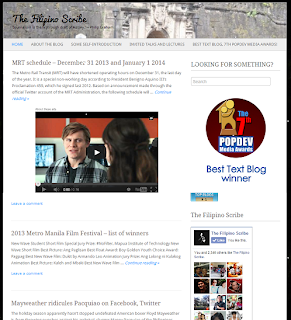 Winner of the Best Text Blog Award, consistently ranked #1 in the Top Blogs Philippines under the “politics and governance”, 5th most viewed WordPress blog worldwide for December 11, 2012 and 13th for November 18, 2013. Blog description: TFS is generally a news, opinion, and general information blog. As much as possible, I try to do my best to give a fresh take on what I write about. For example, when writing about national and local holidays, I also do some research about the history of that occasion. I’m proud that TFS shows my persistent interest in history, politics, and social media. It has received over 2,200,000 page views already from readers in the Philippines and overseas. I have a page on my blog dedicated to this. Haha. Anyway, aside from blogging, I also teach at the tertiary level (Technological Institute of the Philippines). 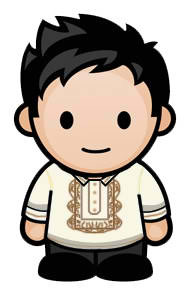 I am engaged too in news and feature writing for Yahoo News Philippines. WordPress blog, which now has its own domain, has been around since March 2011 but I purchased my own domain only last May. I’ve been engaged in blogging years before that through Multiply.com. As an opinionated and talkative person, I always have a lot to say about the things around me. So at first, the blog is just all about self-expression. It still is up to now, though I have a much bigger audience already. What is your biggest struggle as a blogger? Finding the time to keep your blog constantly updated is a major challenge, especially since like other bloggers, I have a full time job as well. Aside from that, I have graduate school responsibilities too. The nature of my blog plus the fact that I have lots of readers adds to the need for The Filipino Scribe to have fresh content. My favourite among the over 500 blog posts I’ve made so far is titled “Is Charice Pempengco lesbian? And so?” I posted it in March 2012, and it’s my third most viewed blog. That’s when the rumors about her sexuality first came about (she only came out this year). It encapsulates what I think about the issue of coming out and being in terms with your sexuality. That’s one thing I’m really interested about. Where do you see your blog(s) and yourself in 5 years? In five years, I think I will more or less stay on the same career path - teaching while occasionally writing. I hope by then I’m already enrolled on a doctorate program, preferably overseas. I want to see my blog have a wider reach, preferably with the help of contributors. The website needs to have a better look (attention, web developers!). Hopefully, it will be self-hosted soon so I can maximize its earning potential. I’m excited to see how my blog can take part in educating the public for the 2016 elections. How does blogging help you, in terms of life and career? When I started TFS in 2011, I just want to rekindle my passion for writing. Two years after, blogging has already opened up so many opportunities for me. Getting recognition and compliments from people I don’t really know in the process are big bonuses. I’m also grateful that because of my blog, I’ve had opportunities to share what I know to others. Now that what I write can be read by many people around the world, I always keep that in mind before posting anything. I began running WordAds shortly after I upgraded my blog. The earnings made me feel a little better off during this Christmas season. Haha. They say there are already many bloggers out there. While this may be true, it is still possible to succeed and stand out. You can do so either by offering something new or by doing something differently. You can do this by making your blogs more insightful or more informative compared to the rest. You can join blog communities like Filipino Bloggers Worldwide and others out there. Interacting with other bloggers will help you a lot. In joining these groups, taking part in comment and link exchanges are inevitable. Keeping your word is a must. Learning some tips on search engine optimization won’t hurt, too. Another note: please be open to feedback. I’m not only talking about the need to have a comment section in your blog. Be as engaging as possible to your readers. Accept mistakes but learn to ignore the trolls. Thanks for this advice/tip it motivites me as a new blogger ... :) happy new year to you. I'm new at blogging and the reason why I decided to blog is because I wanted an inspiration driver to talk about my niche which is photography. By doing so it helps me go out there to create photos as well. I really like reading this article helps me be inspired to blog for the passion of it. The Filipino Scribe had gone a long way. Its very successful that it has a very good reputation. Thiis blog is really a good read! Lot to learn from this author and he has the guts and experiences to tell. That's Mark, I think I met you at PEBA award 2012? nice advice! living in malaysia and attending events with just me as filipino blogger, feels so good for myself and for my blog. It is nice that they somehow recognize me and proud too. I guess there's a good karma when god knows you work hard and love what you are doing. The key is to generate unique content and information that readers will find helpful and educational. Not only will Google be in more favor with the blog's posts but also the readers will become more loyal to the site. Reading blog entries such as these really help new bloggers like me. I think I happened to bump on this blog a long time ago and I find the articles very interesting. Thanks for featuring the blogger here, we an draw inspiration from his words. I have a high regard for The Filipino Scribe because of its valuable and interesting topics and I guess Mark's blog is not only known in the blogosphere but also amongst anchor men as I often heard it being mentioned on radio. Congratulations and keep it up! You have here some great advice for newbies and seasoned bloggers to follow. Galing mo. The articles on The Filipino Scribe are very informative. I love going through it all. It's nice that he was able to integrate his skills and interest to come up with a highly visited site. It's an inspiration. Keep up the good work. Neophytes like me are looking up to successful bloggers like you. Wow! I'm not sure if I have subscribed to the Filipino Scribe yet. Now that I have a backgrounder already I guess it's worth a read. I love his advice to all the bloggers. Yes, he is right in saying that each of us can stand out :) And also, we do not need to overpower other bloggers. We all stand in equal footing :) As long as our lvoe for blogging is there. I think he really deserves to be featured because of his achievements in life that also inspires many bloggers.